In the clinic recently I had a lovely lady who had sprained her knee and the GP had adviced rest. She dutifully did as she was told and rested. However, 2 weeks later following complete rest her knee was still stiff, swollen and painful. 5 days following a few simple physiotherapy exercises to improve movement and early strength the swelling had reduced signficantly and she had much less pain walking and moving her knee. I see many people in the clinic involved in sport who end up at physiotherapy following a vicious cycle of injury, rest, return to sport then re-injury. Rest can be useful in certain circumstances short term or resting from a specific activity that is causing pain but continued rest may cause de-conditioning of tissues, joint stiffness, prolonged swelling, muscle weakness, decreased balance and control. In the Musculoskeletal system cells are stimulated by load and activity. Research into tendons has shown that not enough load shows similar findings in the tendon as too much load (reference here). Therefore, when we sustain an injury stimulating the cells is important for healing. Soft tissues heal within about 6-8 weeks depending on the severity of the injury. During that period we can begin to influence the way that tissue heals through loading it. The correct amount of loading can therefore improve healing and help reduce swelling and prevent de-conditioning. The key is optimal loading. Optimal loading is based on each individual, their needs, and their injury. There is no set recipie and for some injuries this is best guided by a health professional. After an actute injury the key aims are to reduce swelling, pain and restore movement and weight bearing. Within 24 to 48 hours most injuries can start with gentle movements of the joint or joint near the injury. 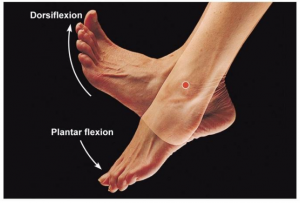 For example following an ankle sprain start with moving it up and down (called dorsi-flexion and plantar-flexioin) and around in circles – repeating this little and often. Use pain as a guide and work within tolerable limits. It is not a case of “no pain no gain”. But early movement will stimlate blood circulation, reduce stiffness and reduce swelling. When it comes to weight bearing I would advice to put as much weight as is tolerated. Do as much as you feel comfortable to do. Do this little and often rather than all in one go. If you are still unable to weight bear after 24 hours get this checked out. It only hurts when I do a specific exercise like running ? Overuse injuries in sport are very common. Often related after about of increased intensity or volume. The injury may present itself as a gradual onset or a sudden onset. Usually it is the activity that causes the pain. Over use injuries are individual and not one size fits all. It may be adviceable that you rest from the specific activity for a short period but within that time you need to address the injured tissue with the exercises to load it appropriately. This will stimulate healing and reduce the deconditioning associated with rest. You may be able to return to the activity quite quickly but it is important to return gradually usually guided by a health professional. If you are unable to return back to your activity get advice from a qualified health professional. Don’t get trapped into the cycle of injury, rest, return to activity, injury, rest. Like so many things in health and injury it’s about balance. When it comes to managing acute injuries I recommend you seek medical advice, especially if there is noticeable swelling or any restriction in joint range of movement or a sensation of giving way. Bony tenderness or difficulty weightbearing are also signs that you should get checked out.